Prepping for 2018 with the ReFresh Weekly Planner! – create trust daily. Prepping for 2018 with the ReFresh Weekly Planner! Running a business, a blog (or two) and being a wife and mom of (soon to be) 4….it is a lot. I have so much going on at the same time I barely have a moment to focus most of the time. But as the new year approaches, I am confident that with the Lord’s guidance (and helping Hand) I will bring some purpose and some peace to the chaos of my normal day to day. Last year, I tried out the ReFresh Weekly Planner from J.Lynn Designery and this year I have purchased the updated 2018 version as well! So what I wanted to do, was take some time and share a little bit of what I expected to use the planner for at the beginning of 2017, how I ended up using it throughout the year, and how I am prepping my new fancy 2018 version. My number one goal with this planner last year was to have some where to track my day to day stuff: doctor appointments, things due for the kids school or activities, and also track chores I would like to get accomplished for the day. I keep track of most of appointments and work on my phone as well, but I had figured out that I function much better writing things down and when I am able to look ahead a little bit, instead of only tracking things on digital media. For work I have an undated daily “To Do” planner that I use when I am in the office. (Unfortunately, this product is no longer available – and what is even more unfortunate is that it is almost 2018 and I have been using it since 2016 – and I am STILL using it every time I am in the office!) This really helps me keep track of things I need to work on and I basically make a list and check off as many as I can that day, but when I come back in the office I have my list of things left to do right there and can either move them over and re-prioritize the remaining + new tasks, or sometimes I just work off the same list if I do happen to come in the office a few days in the row. It truly works great for work. For the monthly pages, I use cute stickers from the Cultivate What Matters – Sticker Book (which slips PERFECTLY into the front pocket of this planner I might add! ), to decorate birthdays and special days. Since holidays are already indicated, I can add festive stickers to those if I want, but really the hard work is done! On Sundays, I write out the important things I have planned for the upcoming week (appointments, sessions for work, my daughters school things, etc.). This has been a BIG help for me to better see what I have planned for the week – as well as keeping our babysitters updated on when we will both need to be at work! Throughout the week I write down chores and reminders in the “To Do” check mark section. As the day goes on I check off the things I accomplish, and reference the list if I forgot what I needed to do next. Last year, I listed out the monthly bills we had and kept track of when I paid them on the blank page before the monthly pages. This worked fine where it was, but I found an even better location for this in the new version. I did have a Book List written out in the back of my 2017 Planner, and I will probably try that again this year. If I am honest, I didn’t use these – but I had good reason! This year I have been actively using my Cultivate What Matters – Powersheets and so these have keep me on line with my goals in a very active way and I didn’t quite need two places to do this. I might sound very forgetful – I am. There are TOO MANY ways for people to contact me and my busy mom brain can’t remember things for very long at all anymore…so having this planner out and open on my counter everyday has REALLY REALLY helped me stay on track! My bills get paid on time, and I can look ahead and see what bills I have coming up so I can make decisions accordingly. How I Plan On Using My Planner This Year – The 2018 Upgrades! I plan on using these the same as well – last year this was super helpful to keeping me on track and productive throughout the week. Some changes in this section for 2018 would be the “This week, I’m focusing on:” and “I’m grateful for:” areas. I think these are super meaningful additions and should really help me keep perspective as my week gets busy! Since I moved my Bills section to my monthly calendar pages, I plan on using the “Important Things” note page before the monthly calendar for a prayer list for the month. It would be very helpful for me to keep a prayer list of things to pray over for the month handy and this seems like a great spot! Can’t wait to put this into action in January! I do plan on continuing using my Cultivate What Matters – Powersheets in 2018 (I’ll be posting about these puppies shortly as well!) However, I LOVE how the J.Lynn Designery team moved the goal planning sections to be broken up throughout the year!! This is a much better way to keep up with goals throughout the year and I know it will be a super helpful change!! I have also been using J.Lynn Designery’s “Things To Buy” notepad throughout the year and it has been super helpful for me to track what groceries I need to get next time I go to the store, as well as just to jot down notes on the fly. I actually keep it out with my open planner on my counter so I always know where a piece of paper is to jot things down quickly! Links, links, here are the links! 1 – If you are interested in checking out, or getting your own 2018 ReFresh Weekly Planner by J.Lynn Designery, you can do so here! 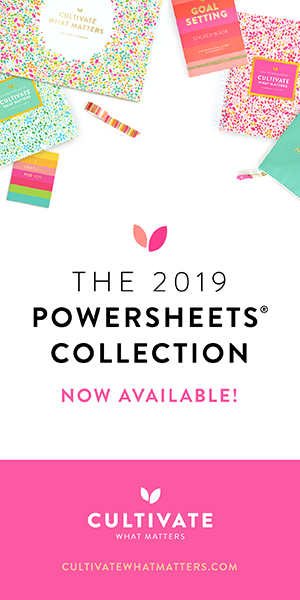 2- If you are interested in learning more about the Cultivate What Matters – Powersheets, you can check out my blog post on them here!